The last month is fitted in place in the rotunda ceiling – January 13, 2011. Formed in October 2009, the Historic Ryde Society was created to celebrate the 175th anniversary of the opening of the Royal Victoria Arcade, in July 2011. It was decided to raise funds for a dedicated heritage centre in Ryde. After the arcade basement was chosen, 12 local artists were commissioned to each create an image reflecting the months of the year. These are the images which appear at the bottom of this page throughout the year, and they are available as notelets or cards via the shop page here. 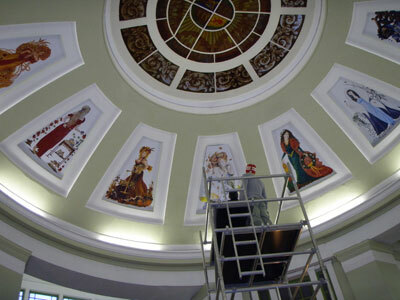 They were installed in the rotunda of the arcade in January 2011. The Society became a registered charity, number 1153947, in September, 2013. It has an ever increasing membership, and events are held throughout the year. If you wish to raise funds for HRS, please sign up for localgiving here or easyfundraising here.